Mrs Dorothy Beedham has generously allowed us to record memories of her childhood and life in Bottesford before and during WW2 during the cold days of February 2007. In addition to this account, she also ran through a list of the shops and other businesses that were in the village during this period [link]. Dorothy is a true Bottesfordian, born in the village in 1921, the daughter of Harold Brewster who hailed from Lincolnshire and Jane Brewster (née Sutton) who was herself born in Bottesford. Dorothy’s grandfather, William Sutton, kept a grocery shop on High Street where she and her three brothers grew up. The children used to play in the shop and hide behind the stacks of tins. The Sutton’s house stood next to Butcher’s Row (a terrace of alms houses on the southern side of High Street where the bungalows at Hand’s Walk now stand). It was a very old, four bedroom house with a large garden and a water pump in the yard. These old buildings were all demolished in the 1960s, though Philip ‘Chip’ Sutton’s house occupies the original site. Grandfather William died in 1924. He had been a keen and able musician, leader of the Bottesford brass band, in which he played the flute. He and his brother played violins in the group of musician who played at church services. This was during the 19th Century, before Canon Norman had the first organ installed, the forerunner of the present organ. He was also a keen angler, and an old photograph shows him proudly displaying an enormous pike caught in the River Devon. Her great-uncle John Sutton ran a sweet shop by The Cross, on the corner of Church Street, where she recalls Mr Calcraft going for a farthing’s worth of sweets (Mr Calcraft retired to Wyggeston Road and died a few years ago, aged 98). Dorothy’s father was the village postman after being invalided out of the army in the First World War. She and brother used to deliver telegraphs by hand for Miss Silverwood, who was postmistress after her dad had retired. She recalls that her mother was a friendly society member. The village had branches of both the Oddfellows and the Forresters, not to mention the Bottesford Friendly Society which had been originally established in 1747. The Welfare State had hardly begun, and these societies provided vital support for their members during sickness and bereavement. Dorothy remembers her childhood as a happy time. She playing whip and top in the street, went paddling and fishing at the Devon sandbanks, and swimming with other girls in the canal at Muston Locks. She was a Brownie, then a Girl Guide, and attended the village school until she left to start work. She first went to school at the age of four. Bottesford Infant’s school was in the old school building opposite the village cross. This Victorian school building had three parts, accommodating the Infants, Juniors and Senior children respectively. The infants were all together in one large room, now the Parish Meeting Room (Fuller Room), and the teachers were Miss Wright and Mrs Brown. She also went to Sunday School, twice each Sunday. Dorothy joined the Brownies and Girl Guides, and was a member of the Young People’s Union led by Miss Wright and Miss James, where she helped with making embroidery items for sales of goods which raised money for people in Uganda. Miss James, who also led an annual collection of clothes and other goods for Dr Barnado’s, lived with her sister at No.6 Church Street. On progressing to the Juniors, now with homework to do, she found that Miss Raithby was strict and would rap your knuckles, but Mrs Ogden was nice. The school day started 9 in the morning and ended at 3.30 p.m. They went home for dinner (no school dinners then, Normanton children brought sandwiches). She recalls that the teaching was good. Scripture was taught by the Reverend Walford, Rector of Bottesford. They had a May Pageant with a may Queen and Pages. The games they played included rounders, tigging, skipping, and whip and top in the High Street outside the school (not known as Grantham Road at this time). She and her twin brother, John Charles, both passed scholarship exams at eleven, and then stayed on at the BottesfordSchool rather than travel each day to Melton. Mr Cox was the well-remembered headmaster, and the other teachers were Miss Ford and Mr Stimpson. She recalls her brothers contributing to making lino-cuts of village scenes, copies of which are still in the possession of village people. The boys played billiards, dominoes and other games at the Youth Club in the Coffee House, but this was boys only. The family was not able to take holidays together, but she recalls the annual village rail outing to Skegness where she remembers they all met together for tea. Mr Cox volunteered for the army at the start of the Second World War, and was replaced by Mr Stimpson. At some point after the war ended, the headmaster was Mr Laurence Dewey. These teachers were the main authors of “The Northeast Corner”, an unpublished account of the history of the Vale of Belvoir from Pre-Historic times to the 19th Century. On his retirement, Mr Dewey was replaced by Mr Alan Reed. The infants and juniors moved to the new Bottesford Primary School, and then the older children moved to the Belvoir High School. In 1935, leaving school at fourteen, Dorothy became the first woman employed at D.E. (Desmond) Chandlers’ agricultural ironmongers and workshops on Westgate, Grantham, opposite the Blue Ram. The workshops extended back to the railway, and the company sold everything. Dorothy was the office girl. Mr Chandler lived in Easthorpe Manor and often gave Dorothy a lift to work, though she also went by train. She worked nine to five-thirty six days a week, started on 10 shillings a week pay, and had 1 week holiday, later 2 weeks. She also attended night school, on a business programme held in school rooms. It was a happy time. Chandlers were known to be a very helpful shop that lasted up to ca.1970. They had a hatchery and sold everything from chickens, and poultry houses, to tractors. When the Second World War broke out, she was conscripted for War Work, and was employed on an armaments production line making guns at Grantham Productions, part of British MARCO. The factory was struck by bombs once or twice, but continued in production. She also served with the Air Raid Precautions (ARP) under Mr Silverwood, acting as a messenger from their village HQ in the building now occupied by Sid Culpins’ greengrocers on Queen Street. Her father was in the Observer Corps, stationed in the post whose remains can be seen on Beacon Hill. Building the aerodrome at Normanton brought a flux of construction workers, many irish, into the village in 1940-41. She remembers the Lancaster bombers taking off over the village, and the red warning light that was mounted on the church spire (worked by a switch set on the side of Providence Cottage). In the early part of the Second World War, the Brewsters took in an evacuee from Sheffield, a nine year old boy called Maurice Pemberton, who had a brother and two sisters also lodged with families in Bottesford. He was a nice boy, who turned up with just the clothes he was wearing and his gas mask. He was made at home, clothed and sent off to attend a special school set up in the chapel until after staying a year his family took him back. Dorothy married in 1942, her husband on a weekend pass before spending three years with the Army in the Middle East and Italy. Her twin brother Charles was called up and joined the airforce. He served in India, and returned home after the war (he died three years ago, 2003). Her younger brother, Philip, joined the navy but tragically went missing at sea. Her elder brother, William, married a girl from Wellingborough and went to live there before the War. He joined the army and was one of those evacuated from Dunkirk. After this he became ill, and he died soon after the war ended of his illness. 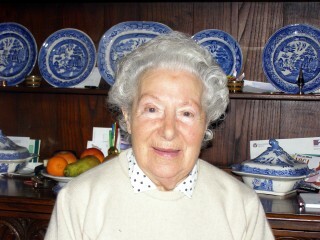 Dorothy is a founding member of the Bottesford Local History Society, and regularly attends its meetings. Before that she was joint secretary of the local WI branch alongside Mrs Edna Daybell. The chairman was Mrs Parr who came from Elton. She has seen the long series of post-war changes that continue to transform the village. She remembers knowing everyone in the village during the 1950s, but adds that sadly this is no longer possible. She is very well regarded, and known to have a large collection of old photographs and other items of historic value concerning the village. This page was added on 23/03/2007. I have memories of going round to play at Dots as a child when she had visitors to stay and she always made me very welcome glad to here she is still alive and well. Dot B was and still is a very good friend of mine since my then wife, Pam, came to Bottesford in Jun 1982-10 Albert st. Then Pam and I opened up HOBSONS CHOICE Drug Store at 7 Queen St. A true friend for many years to both me and Pam before she died on 15 Feb 1995. Merry Christmas Dot and to all that recall me being in the lovely village from 1982 to 1998. Dorothy and Arthur Beedham lived 2 doors down from us when we first moved to Albert Street in December 1981, and they were very welcoming to us ‘village newcomers’. We were also opposite Alan and Pam Millership (as in the comment above from Alan) and their very energetic springer spaniel! Happy times for us all.